Are you ready for a new perspective about time? For all our anxiety about, or enjoyment of, time, we each have the same amount of time each day. We can’t stop it, or find more, but we can change the way we use our time and the way we look at time. There are 120 twelve-minute segments in every day. If you work 8 hours each day, that comes out to 40 twelve-minute segments. That’s 73 hours a year that you can use to write a book, make new connections, or take steps towards reaching your dreams. Along the way, challenges will come up that are outside of our control. But when they come, we can determine our own response and rise to meet the challenge. By changing our beliefs, attitudes, and perspectives about time, we can change our behaviors about time. When we change our behavior, we will change our days and our lives. How will you use your 12 minutes? 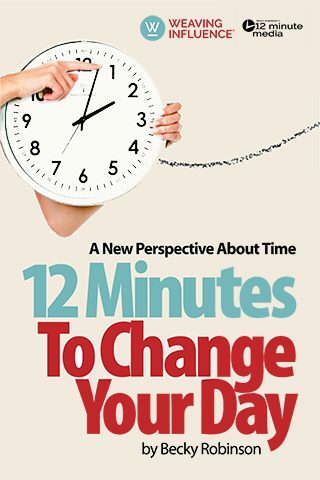 Start your 12 Minute Journey by downloading 12 Minutes To Change Your Day. Want to join with others on this journey? Download this free e-book to begin changing your day 12 minutes at a time, and then use #ChangeYourDay to connect on Twitter.